This past Saturday, I attended the Blue Commonwealth Gala in Richmond, the Democratic Party of Virginia’s (DPVA) signature annual event. As I sat there for three hours I couldn’t help but think that this was the way to kill the Democratic Party. Speeches for three hours, plates of gluten-free chocolate cake that had been resting on the table for hours, and a dinner costing $150 are not going to bring in the much needed 18 to 34-year-old demographic needed to vote. According to Pew Research Center, as of November 2016, an estimated 62 million millennials (adults aged 20 to 35) were voting-age U.S. citizens. Yet a Brookings Governance Survey found that only 50 percent of millennials that are registered as Democrats self-reported to have voted in the 2016 election; up only 1 percent from the 49 percent that voted in 2012. This means only half of young people who identify as Democrats vote. Imagine if the other half voted in 2016? As a 32-year-old woman who founded and now directs a progressive group in Hampton Roads called Peninsula Voices for Change, I frankly only attended this dinner to hear Cory Booker speak. Like all of these events, I had to wait for two hours and listen to Dorothy McAuliffe (why? her husband is no longer in office), former-Gov. Terry McAuliffe, Congressman Donald McEachin, Congressman Bobby Scott, Lt. Gov. Justin Fairfax, Sen. Mark Warner, Gov. Northam, the governor’s wife Pam Northam, Sen. Tim Kaine and his wife Anne Holton, along with various state delegates before Sen. Booker even spoke. I may be forgetting someone – it was a long night of standard stump speeches. And yet, I found it particularly interesting how politicians cited their accomplishments – many coming from the direct advocacy of the people who elected them – with the pronoun “we”. I have always believed that even though politicians cast the votes, they represent the people that elected them. Wouldn’t that mean that the accomplishments that were touted would actually be those of the people they are supposed to represent? The accomplishments are for every person who states their frustrations with politicians and the policies they are advocating. They are for those who donate money they don’t have to politicians who make promises to improve their lives. They are for the people who canvas and bring friends to the polls on election day. The question then remains: Why were these accomplishments not mentioned by the Democratic political class this past Saturday? I will tell you what I did not hear, though; and that spoke louder than what I did hear. I did not hear what actionable things these politicians are doing regarding the children who are being ripped from their parents at our southern border. I did not hear about Trump’s attempts to repeal Title IX protections from women. I did not hear about the importance of voter registration; about how every single person should make sure they take at least five of their friends to the polls. I did not hear about voter suppression either. I did not hear about how every 18-year-old needs to be registered to vote so Corey Stewart, with his “bring back the Confederacy” pandering, does not continue to mainstream white supremacy. I did not hear about how Democrats were going to connect with communities of color and the LGBTQ community. 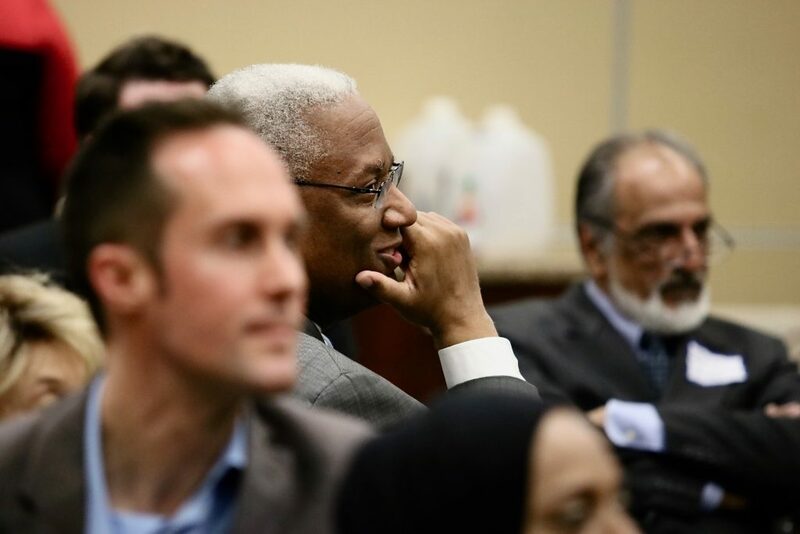 And most importantly, I did not hear about how the Democratic Party of Virginia was going to diversify and evolve into the 21st Century to address the complex challenges we now face. Speaking of DPVA, the only person in attendance that actually mentioned the pay gap experience was Sen. Booker (from New Jersey). He said that the Democratic Party is the one political institution which not only cares about the people sitting at the fancy dinner, but the people who clean up afterward. And he should have. But why didn’t any of our own Democratic politicians from the Commonwealth bring this point up? Virginia is a state with incredible pay gaps. According to the National Education Association – estimates of school statistics from 2016 to 2017 – teachers face a 40.2 percent pay gap, as teachers on average are paid $51,049 and college graduates can make up to $85,432 – currently the largest in the country. A report produced in 2016 by the National Partnership for Women and Families showed that women in Virginia are paid 80 cents for every dollar paid to men, amounting to an annual wage gap of $10,419. Perhaps this is why the Democratic Party of Virginia is missing out on 50 percent of its millennial voter base. I am not the Chair of the Democratic Party of Virginia; yet if I was I would have designed this event differently. Let me tell you what I would have done to engage the people who need to be brought into the party: I would have organized a meet and greet with a flat price of $20. I would have invited food trucks from all over Richmond to cater the event (isn’t Richmond known for its stellar foodie scene?). Prior to the event, it would be explained to all elected officials that no speeches would be given. Instead, politicians would be encouraged to mingle with attendees directly. For once, politicians should be in a position to listen and not speak. The theme of the event would be: ‘How to Improve Engagement in Politics‘. Faced with the Trump insurgency and a candidate like Corey Stewart, who will use fear and hate to compel his campaign, we should not underestimate how effective this might be – therefore, the only question we must ask ourselves right now is: how can we engage the 18-34-year-olds, women, people of color, and LGBTQ community? 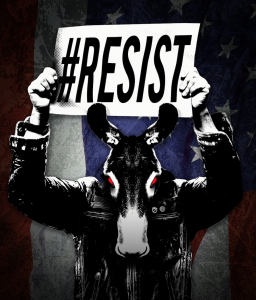 If this event was targeted to the people whose lives are being threatened by Trump and his administration – and the cost of this event was actually affordable – I believe the Democratic party could live up to its creed of being the party of the people. If this party was truly representing educators who are barely making a living wage, and women that are earning significantly less than men then they would create an event that acknowledges pay gaps like these – not host an event that just congratulates each other in front of one another. I am so disheartened after this event. I have considered the possibility of running for office, but I cannot imagine running for office with a party that does not include the people who need its help most. Here is the bottom line: I believe that if Virginia is going to flip and if we are going to take back the country from Donald Trump and the worst of his supporters, it is up to us to engage with new demographics and new audiences. It is up to people like me and like you: young people who are angry, scared, and pissed off. People who are tired of waking up and seeing children living in tents, ripped away from their parents. People who believe that the taxes we pay mean that we are entitled to health insurance and someone in office who will fight to protect our rights – not the rights of people that can easily afford $150 dinners and the weekends that go along with them. 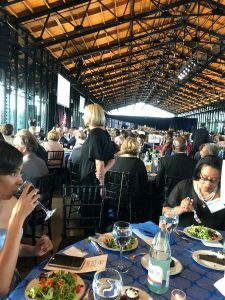 This is what the Blue Commonwealth Gala in Richmond this past Saturday failed to acknowledge and in doing so, failed to acknowledge what the next generation of the Democratic Party wants to see from its party and politicians. 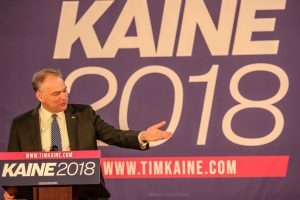 Tim Kaine, the incumbent Democratic Senator from Virginia, held his first campaign kick-off rally this evening at Maggie Walker High School in Richmond. Set against the backdrop of campaign signs and bluegrass music from the Cary Street Ramblers, a crowd of around 300 people gathered in the gymnasium to hear the senator announce his re-election. 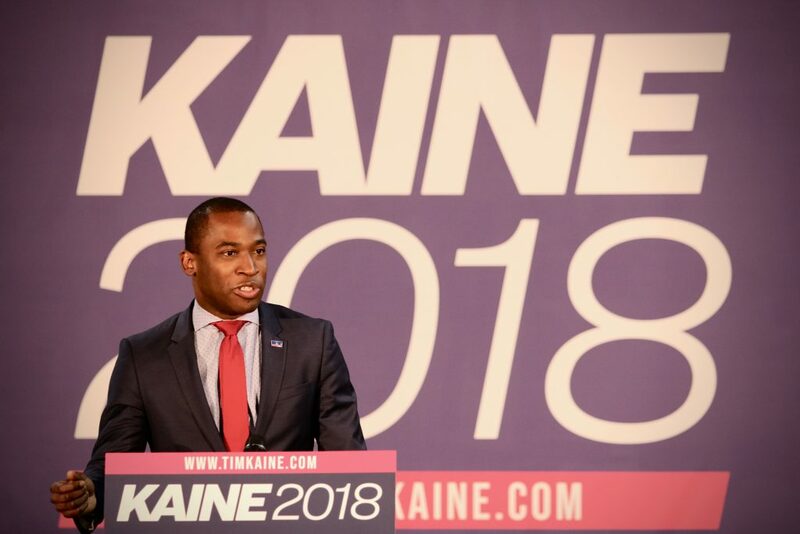 The event included speeches from other notable Democrats including Mayor Levar Stoney, Congressman Donald McEachin, and Democratic Party of Virginia (DPVA) Chairwoman Susan Swecker, who fired up the crowd with a roster of Kaine’s achievements and calls to fight against the Republican agenda during midterms. His rally in Richmond is part of a statewide barnstorm over the coming week which will take him to Hampton Roads, Northern Virginia, the Eastern Shore, western parts of Virginia, along with other underserved locations throughout the Commonwealth – a key point he made during the rally. 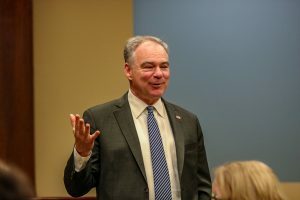 Kaine, a Richmond local elected to the Senate in 2012, has a vast political resume including city councilman, mayor, and governor, along with being the vice presidential candidate for Hillary Clinton in 2016. He is one of only a few national politicians who have ascended the political ranks in this way, a progression that has made him a popular candidate in Virginia. 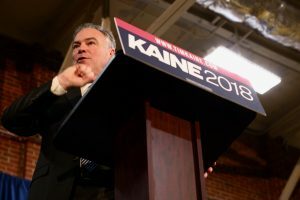 Kaine will face a crowded Republican primary field, including neo-Confederate and failed governor’s candidate Corey Stuart, an evangelical preacher named EW Jackson, Delegate Nicholas J. Freitas, and tech investor Ivan Raiklin. Yet according to a poll conducted by Christopher Newport University in early March, Republicans remain undecided on who they will favor during the primary process. 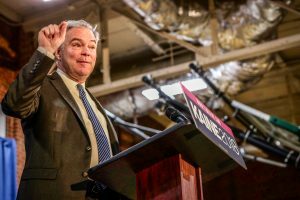 Kaine currently maintains a 53 percent favorability rating and a 20 point lead over his Republican rivals. 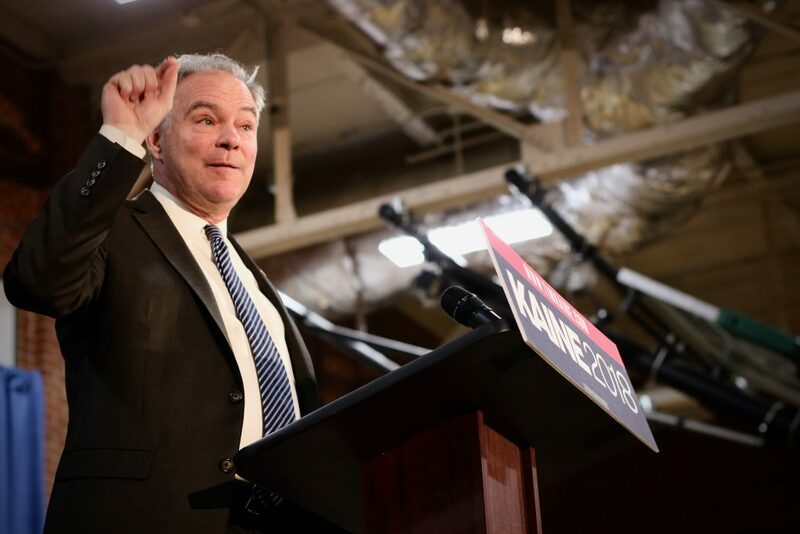 When compared with Trump’s 37 percent approval rating in the Commonwealth, the incumbent senator has reason to be optimistic – more so, because 57 percent of people polled also believe Virginia is on the right track. *John Donegan contributed to this report. Photos by Landon Shroder.